So cute for your little one to wear for his animal themed birthday party. 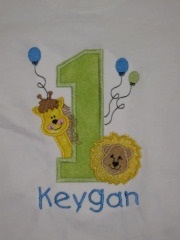 This shirt is appliqued with the child's number and has balloons and two animals. I will add your child's name for free.